It can be a challenge to obtain detailed inventory feeds for your dealer marketing services. DMS extraction information only provides part of the information you need. If your business needs more detail we can help! If you require pre-decoded inventory feeds and actual photos, then our dealer inventory feeds may be an excellent solution of choice. Discover outlines of key strategies and offer recommendations for those looking to market inventory online. 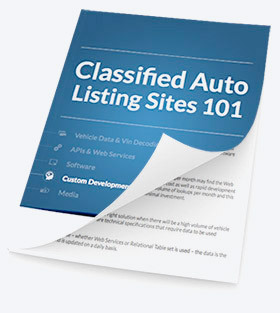 This free white paper provides best practices and useful suggestions for those looking to establish a classified auto listing portal. A complete DataOne Software catalog of products and services including vehicle data, VIN decoding, software, APIs and more! Whether you would like to discuss your business' data needs or determine which of our offerings are a best fit for you, our team is available to answer your questions. Nothing beats a hands-on experience. Start your no obligation, no pressure, 15-day free Data & VIN Decoding Trial today.